Suspense-filled. Unique World. Engaging heroine. 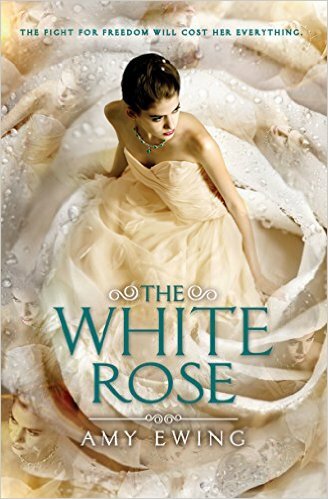 If you loved Rosamund Hodge’s Crimson Bound, you’ll love The White Rose (Jewel series Book Two) by Amy Ewing! SUMMARY (from back): Violet is on the run—away from the Jewel, away from a lifetime of servitude, away from the Duchess of the Lake, who bought her at auction. With Ash and Raven traveling with her, Violet will need all of her powers to get her friends, and herself, out of the Jewel alive. WHAT I THOUGHT: I thoroughly enjoyed Ewing’s first book, The Jewel, which is why I preordered The White Rose as soon as I finished it. That said, this book lived up to my expectations and then some. The world of the Jewel expands dramatically in this installment for Violet, Ash and Raven are on the run and must navigate the four rings in order to find safety in the outermost, The Farm. Page-turning suspense built as they continually had to overcome obstacles to a safe passage through each ring. While book one gave a glimpse of the rings, book two gives more depth and richness (or impoverishedness as the case is) of each as Violet and her companions navigate each. We come to appreciate, all the more, the unfairness thrust upon all who exist to serve the needs of The Jewel. We also come to learn that this world is actually an island that has been abused for centuries–we learn it seeks to restore itself to harmony and balance and will assist all who work to that end. How this manifests is a very imaginative take on the world that is well done and believable. Violet also grows in Book Two. We knew she had strength as a surrogate, but together reader and character begin to understand more about that strength as she attempts numerous quests to save friends, endure the unknown, and even help those she loves realize their deepest needs even when it seems foolhearty. One such example is when Ash must see his little sister who is dying. Ewing stacks the situation with everything you, as the omnicient reader, know is crazy to even attempt the effort, but she uses it to reveal more of both Violet’s and Ash’s characters. As an author, I always have a character’s name represent their role or give some hint about what we can expect from him/her. Ewing clearly utilizes this tool as we see Lucien live up to his name, which means bright light or leader, as we find he is the leader of the black key resistance that is giving inhabitants of every ring of the Jewel hope for a different future. The one very minor issue I had was with the character of Garnet, the son of the Duchess of the Lake. Somehow he just always shows up at just the right moment to save the day. The thought kept running through my mind, wouldn’t the Duchess know if he stayed out all night, etc? He seemed too convenient at times. But as I said, that was a very minor issue and based upon Garnet’s minor supporting role for now, it’s not a big deal. I will enjoy seeing how he develops in Book Three. The book is clearly the middle of a series as throughout, the next installment is set up. We see this as three new surrogates join the cast and questions are planted re: how they will behave relative to the mission–will they help or hinder the cause, Violet’s sister, Hazel, is taken to be a surrogate, and Violet finds her little brother has joined the resistance. It is clear Violent has much to lose and much to gain as we move forward. I know I’ve discovered a great book when I find myself genuinely worried about what happens to the characters. This was one such book! Well done. I’m giving it 5 stars. This sounds like a great book. I love books where the heroine develops and we get to see all her flaws along the way. I’ll definitely be adding this to my TBR! Yeah! I’m glad I could help with yet another read for your TBR… LOL! Sounds like an interesting series with strong characters.